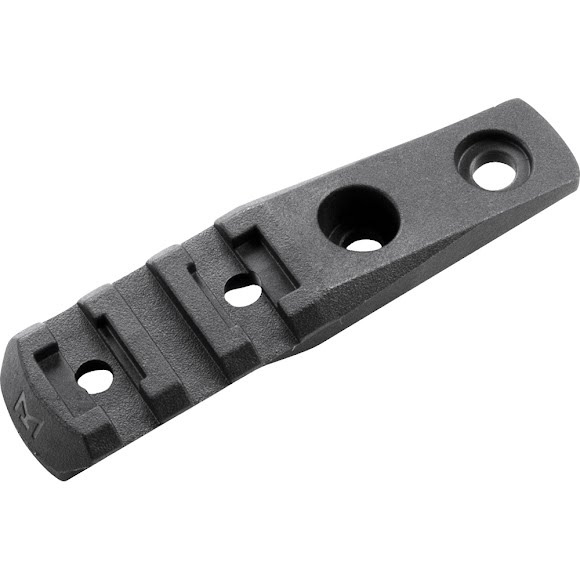 Designed for use with all M-LOK® mounting surfaces, the Magpul M-LOK® Polymer Cantilever Rail/Light Mount allows the attachment of various MIL-STD-1913 Picatinny spec rail-mounted accessories such as lights and optics, and directly interfaces with the popular Surefire M300/M600 series Scout Lights or Magpul Light Mount V-Block and Rings. Designed for use with all M-LOK® mounting surfaces, the Magpul M-LOK® Polymer Cantilever Rail/Light Mount allows the attachment of various MIL-STD-1913 Picatinny spec rail-mounted accessories such as lights and optics, and directly interfaces with the popular Surefire M300/M600 series Scout Lights or Magpul Light Mount V-Block and Rings. The Cantilever Rail/Light Mount has Picatinny slots that extend forward .75"-1.5" past the M-LOK® mounting slot to improve ergonomics and optimize accessory positioning in a wide variety of uses, while keeping lights and accessories low to reduce the weapon&apos;s profile. Molded from heavy-duty reinforced polymer to save weight and expense, the Cantilever Rail/Light Mount also features beveled ends and corners to reduce snagging and sharp edges. All hardware necessary for attachment directly to M-LOK® Slots on either aluminum or polymer hand guards and forends is included. 3 MIL-STD-1913 Slots, max overall length of 3.15 in.